This 4-bedroom villa for up to 7 guests is located in Senj and has a private swimming pool. Single-family house Senj, 2 storeys. 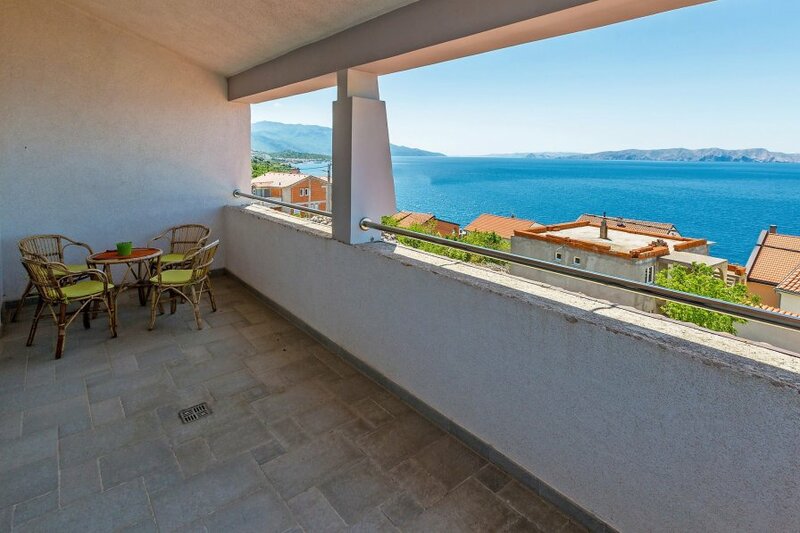 2.5 km from the centre of Senj, in a quiet, sunny, elevated position, 200 m from the sea, 200 m from the beach. Private: property 520 m2, garden with lawn 70 m2, swimming pool angular (7 x 3 m, 24 m2, depth 150 cm, 12.05.-15.09.). Outdoor shower, barbecue. In the house: internet access, central heating system, washing machine, tumble dryer. Parking (for 3 cars) at the house on the premises. Shop 2.5 km, restaurant 250 m, pebble beach 200 m (small), concrete beach 200 m. Please note: groups of teenagers on request only. Private mooring (extra) on request. 5-room house 180 m2 on 2 levels, south-west facing position. Living/dining room 52 m2 with cable TV (flat screen), air conditioning. Exit to the terrace, to the swimming pool. 1 room with 1 double bed (2 x 90 cm, length 200 cm). Exit to the balcony. Open kitchen (4 hot plates, oven, dishwasher, microwave, freezer, electric coffee machine). Shower/bidet/WC, sep. WC. Upper floor: entrance hall with air conditioning. 1 room with 1 french bed (160 cm, length 200 cm). Exit to the balcony. Gallery. Office. Gallery, with sloping ceilings, ceiling height 150 - 220 cm with 1 bed (90 cm, length 200 cm). 1 room with 2 beds (90 cm, length 200 cm), TV and DVD. Exit to the balcony. Gallery. Shower/bidet/WC. 2 balconies 6 m2, balcony 10 m2, terrace 35 m2, roofed. Terrace furniture, deck chairs. Marvellous panoramic view of the sea. Facilities: Internet (WiFi, free). Garage (2 cars).